Head down I walk along the beach, looking for bits of sea glass. Opaque bits of white, green, turquoise, brown and blue lie in the sand, tossed ashore on the ocean's whim. They have tumbled over and over in the water, colliding with rocks, with sand, with debris, until their once sharp edges are worn into smooth loveliness. I pick them up and put them in my pocket. Small white stones find their way into my pockets until the fabric sags with the weight. They, too, have been shaped by the force of the sea. I am not the first to draw parallels between the experience of life and the sea. I know that, by God's grace, my rough edges are being worn down like the sea and sand polished flotsam. Lovely post and images.. The sea glass is beautiful.. Have a happy new week! I've never seen sea glass. is it just broken scraps of glass that the sea has tossed up or is it sand that has gone through some process over time? The log looks as if it is all ready in the Swedish way for a campfire. What a lovely post! I used to collect shells when I walked along the beach on Galveston Island. It is a soul soother ... that walk. I don't have that beach to walk on, but I did walk around the neighborhood this morning collecting bird feathers and pine cones! Have a great week! Terrific collage! I would be collecting sea glass too if I lived near the ocean. It is fascinating to see what the sea can do to rocks and glass, becoming colourful baubles to collect as one saunters along a beach. We live by an inland lake so there's nothing to collect, but still a beautiful view to enjoy. Oh so beautiful! Love the sea glass. A pebbly shoreline such as this is the best place to look for sea glass, Lorrie! You found some pretty colors of it. I have a large bowl full from the beaches in Southern Italy near my husband's home town. Oh I saw that beach photo and it immediately reminded me of our trip to Vancouver Island last fall (Tofino was our destination with a stop in Nainamo). And now I see you live on the island. What a lovely post! I have a collection - small, very small - of sea glass. I consider it a treasure. Beautiful mosaic, Lorrie, I'm a beachcomber too although I tend to find more shells than sea glass. Like you, Lorrie, I always come home from the beach with heavy pockets. I find that beach glass is becoming more and more rare. How true! Love the sea glass you found. Gorgeous, gorgeous collage! I loved the colors and your photos are SO lovely and so peaceful! Beautiful collage......love the colours you've used,especially the blues. Such beautiful words ..... the sea glass is just beautiful. Beautiful mosaic, Lorrie! I really enjoy beach combing and looking for treasures washed up in the tide. Have a beautiful week. Beautiful. you have eye for all that's beauty. Lovely photos, lovely gatherings, lovely thoughts. There is something about being on the beach that opens up our minds, and frees our hearts. Most beautiful...your gifts from the sea and the collage! Nice collage! I love that sea glass. Beautiful images thank you Lorrie! I agree, when we are by the sea, it is hard not to think about the wonder of God and the many gifts He bestows on us! I am always spellbound by everything in nature and Who is behind it. 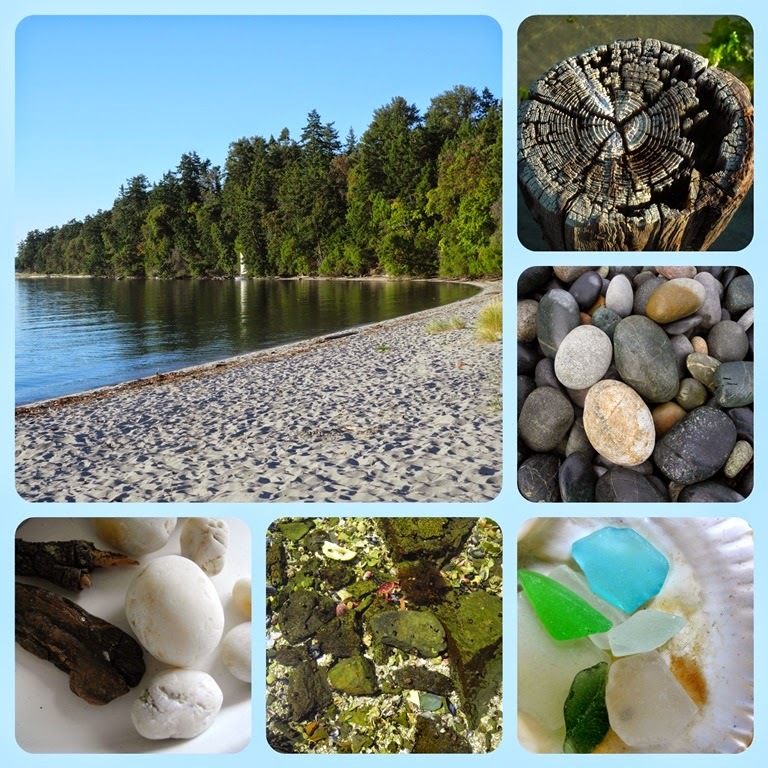 I adore the sea and walking the beach to discover fun things like sea glass. A Stuck Foot look around on the beach would be great...wonderful mosaic! Lovely photos and thought. I didn't see any sea glass this summer during my visits to the beach, but I did get an interesting driftwood and some beautiful shells. It's always a special treat for me to find sea glass.